I’ve never liked running. Between ballet classes, running around with my three siblings and spending my summer months in the backyard pool, I was never short on exercise. I could hardly keep up with my quick metabolism! In my middle school glory days of track and field events, I somehow managed to run on the “distance” team, scraping by in third or fourth place almost every race, but I hated it. My short-lived track and field adventures led me to pursue cardio alternatives. Whether attending a spin class, biking on the weekends or maybe even as transportation to work, a little cycling can get you a long way. Don’t believe me? Find out here how you could be biking your way to better health, but don’t forget to cycle sensibly. A recent study of almost 50,000 Americans examined cardiovascular health between runners and walkers. The research found that brisk walking can be just as effective as running in reducing heart health risk factors. You may hate running, but it’s no longer an excuse not to walk. 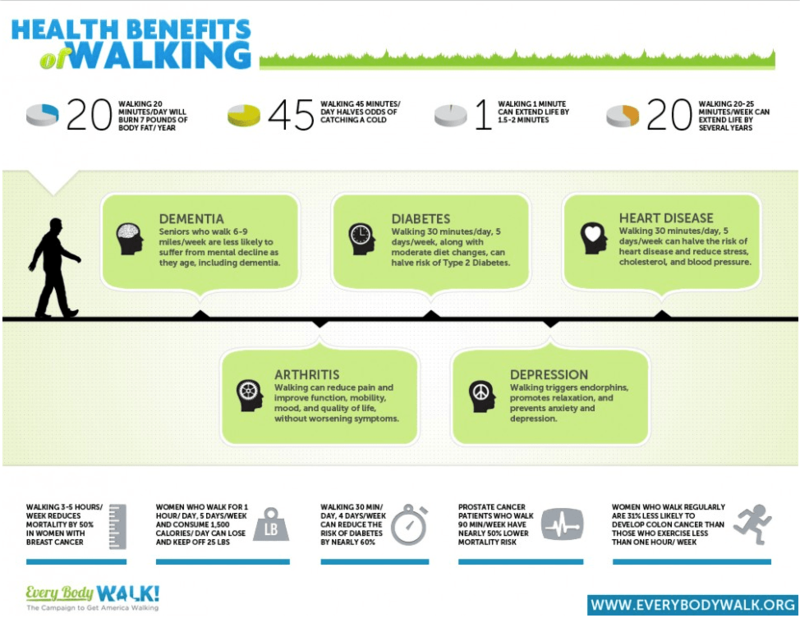 Here is an infographic from Everybodywalk.org sharing some of the health benefits of walking. Rollerblading became my newest venture when I was gifted a pair of inline roller blades for Christmas. The low-impact exercise is so fun that it does not feel like a workout. If you don’t feel like running but want to get some speed, this might be the perfect cardio alternative for you. Choose cardio exercises you enjoy. Physical fitness should not feel like a punishment. If you’re looking for other moderately intense cardio alternatives, the The U.S. National Heart, Lung, and Blood Institute (NHLBI) offers a helpful guide to physical activity. Whether you are swimming laps, jumping rope or taking a dance class, reducing a sedentary lifestyle can be enjoyable! Exercise	No gym? No excuse. Get your exercise on.